This is what the typical conversion funnel looks like. 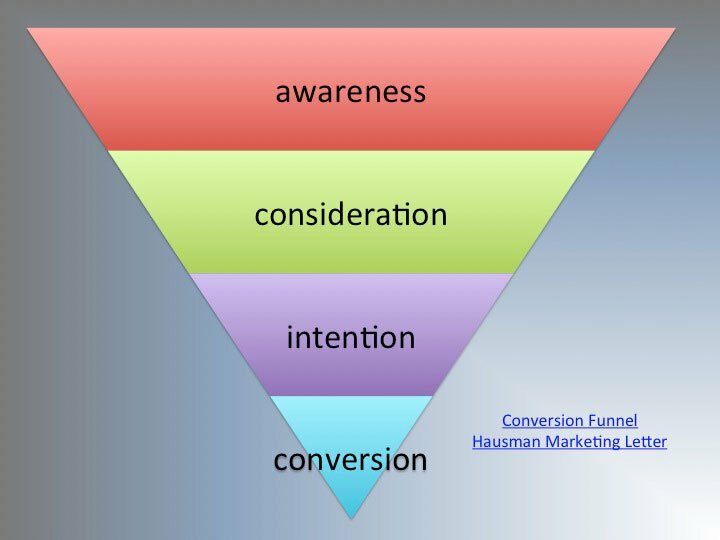 Top of funnel marketing refers to efforts aimed at awareness and consideration while conversion is the bottom of the funnel. Conversion is the holy grail — the point where all your marketing efforts pay of and money flows into the corporate bank account. Sure, you want to measure how your marketing efforts translate into conversions (ROI). But, a singular focus on conversion or ROI or bottom of the conversion funnel leads to short-term decisions that may cripple the long-term success of your business. In their efforts to be more data-driven, organizations pushed marketers to support their contribution to success turning marketing from a cost to a profit center. For many organizations, this meant a focus on bottom of the funnel — ROI. And, I won’t attempt to marginalize the importance of bottom of the funnel marketing and analyzing the return for your bottom of the funnel marketing efforts. What I will do is draw your attention to the funnel — it has the shape it does because conversion relies of success at marketing activities aimed at earlier positions on the funnel. So, the more you pour into the top of the funnel, the more there is to flow out the bottom of the funnel in terms of returns. Even though market performance rests squarely on the bottom of the funnel, that performance is supported by actions aimed at top of funnel marketing. The problems associated with measuring top of funnel marketing existed with traditional media, as well. Advertising agencies struggled with ephemeral measures representing awareness and consideration. For instance, agencies might tip in an ad and ask for aided or unaided recall. Recall — awareness — doesn’t get you very far down the conversion funnel, but it’s a critical step. Conversion can’t happen if the target market doesn’t even know you exist. Take a look at this infographic and let me know what you think about metrics at the top of the funnel? Do these metrics seem to be the most salient for moving folks down the funnel toward conversion? Does it take more than simple awareness of a brand name to really begin the conversion process? To me, it seems the infographic is a little light in terms of the metrics needed to assess top of funnel marketing activities, especially in digital marketing where we have a lot more information available than in traditional marketing. Are you creating digital awareness? Creating digital awareness is a function of owned media (your own social profiles on Twitter, Facebook, etc), earned media (engagement that shares and amplifies your messages across social networks), and paid media (Adwords, Facebook Advertising, etc). Measuring top of funnel marketing effectiveness means assessing performance across these 3 types of digital media. Assessing owned media – metrics assessing owned media should encompass your social platforms, website, and PR (including email marketing). Gather stats like Reach, #Fans, #Visits, #Opens from these media to assess performance of owned media in creating awareness of your brand. A good social media strategy should not only build awareness of the brand, but position the brand with a brand image that resonates with your target audience. Assessing earned media – metrics assessing earned media are contaminated with factors impacting evaluations of your brand because out attitudes towards the brand are affected by WHO shares information about the brand. Each brand share and brand comment acts as an endorsement (or condemnation) by friends in our social networks. To an extent, our relationship with the sharing friend clouds our brand image. A brand becomes imbued with the character of the friend who shared about the brand — acting in the same way as a celebrity endorsement in traditional media. That’s why we talk about micro-celebrity in digital media. Thus, in assessing earned media, you want to measure shares and RT, as well as unsolicited comments about your brand. Also, monitor influencers who share your content since it matters who shares about your brand, not just that it was shared. Assessing paid media – Adwords, Facebook, and other digital advertisers offer great tools to assess paid media. Pay attention to measures such as reach, frequency, click-through rate (CTR), and cost per click (CPC) to assess performance of these top of funnel marketing efforts. You can classify marketing efforts aimed at influencers and other forms of user-generated content as either earned or paid media. Metrics such as #brand mentions can evaluate the performance of these word of mouth efforts aimed at top of funnel marketing. Are you generating digital consideration? Positive sentiment is a necessary condition for purchase — consumers don’t buy brands they think are “bad”. However, positive sentiment isn’t enough. Consumers buy brands they view as “for me”. Let’s take a look at the concept of “for me”. We talk about a consideration set as those product a consumer views as “for me”. A lot of factors go into determining whether a product goes into a consumer’s consideration set, such as price, sentiment, emotional connection, recommendations, etc. One of the most important factors in placing a product in a consumer’s consideration set is what friends are buying. Buying recommendations can be endorsements or tacit endorsements, such as pictures showing a friend wearing/ using a product. Endorsements result from either earned or paid media. Are you generating digital intentions? Just because someone wishes to buy your product (has buying intentions) doesn’t mean they act on them. Sometimes, they search out more information about your brand only to change their minds about whether to buy it. Sometimes, they intend to buy your brand only to be thwarted in their efforts. It’s really important to understand which of these factors interrupted a consumer’s intention to buy your brand and, to the extent possible, remove factors interfering with purchase intentions. To do that, you need to understand what’s happening by mapping consumer digital actions. Information search turns up negative factors – Organic search and paid advertising indicate a buyers intention to purchase your brand. They come to your website with your brand already in their consideration set and you either make the sale or lose them based on what they see on your website. A great user experience is critical for converting these potential buyers. Making information easily available, using proper filters to help visitors find products, and giving visitors feedback from other buyers goes a long way toward closing these deals. But, a great user experience isn’t enough. Converting visitors requires an understanding of what’s important to them and showing how your brand meets their needs. Metrics important for monitoring intention to buy include clicks from organic search, paid search, and social networks — note distinguishing between consideration and intention metrics is challenging and the distinction isn’t particularly meaningful as long as you measure clicks somewhere. Also important for monitoring intention to buy are paths through your website (clickstream) and entrance and exit data. having to register — the easier you make the process the higher your conversion rate. If you need registration information, consider allowing openAuth (registration using Facebook or Twitter, for example) or asking for registration information at the end of the process when sunk costs encourage users to continue. too many options — consumers delay decision-making or simply don’t make a decision when faced with too many options. Think about looking at wallpaper samples and you’ll see how choice impacts decision-making. financing challenges — sometimes consumers need a little help paying for something, so offering payment options or financing makes purchase easier. Other times, consumers don’t want to provide financial information online so offering PayPal or other centralized payment options reduces discomfort. reduce risk — sometimes it’s the financial risk of making a bad decision that causes consumers to abandon purchase intentions. Offering free trials or using the Zappos model of offering free shipping both ways reduces this risk. I hope I’ve convinced you to pay closer attention to top of funnel marketing metrics and to place more effort on marketing at the top of the funnel. If you have suggestions for improving top of funnel marketing, please leave them in the comments.